But The Early Show Saturday medical contributor Dr. Mallika Marshall explained that, when it comes to vitamins, too much of a good thing could be a bad idea and, with some supplements, doctors are coming to feel ANY dose may be ill-advised, with supplements pushing the dosage level into the risky range. Vitamin and mineral supplements are, of course, a staple of a lot of people's lives. But studies are now suggesting that some are not only unnecessary, but could be dangerous. Of course, we all need vitamins, Marshall stresses, but only in very small amounts, and we generally get what we need from what we eat. So if you're generally healthy and eat five or more servings of fruits and vegetables a day, you're probably just fine, vitamins-wise, and you might be better off saving your money. 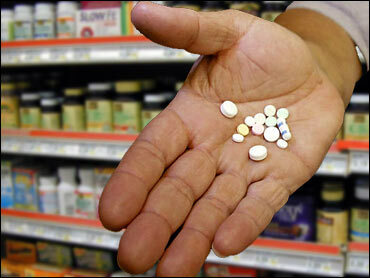 Some vitamins can be dangerous in high doses. For instance, Vitamin E is touted as helping to fight cancer and heart disease. It's one of those anti-oxidants we all hear so much about. But, Marshall points out, new studies and more recent data suggest that large doses can actually increase the risk of death, not prevent it. So we are not recommending that people take Vitamin E supplements for disease prevention. Another popular supplement for fighting certain diseases, beta-carotene, used to be thought of as helping to prevent disease, but now it appears that additional beta-carotene can actually raise the risk of heart disease and cancer. Loading up on Vitamin C to fight off colds is also coming to be panned in the medical community. Too much Vitamin C can cause diarrhea and kidney stones, and studies don't suggest that it reduces the risk of heart disease, cancer, or even the common cold. Vitamin A, another popular choice, can actually lead to liver damage, blindness, and bone fractures in high doses. Of course, Marshall notes, there are exceptions - people who, due to poor nutrition, underlying medical problems, or the desire to have children, need to take vitamin supplements. But again, beware - in some of these cases, taking additional vitamins can actually be harmful. Still, there is substantial evidence, Marshall says, that taking folic acid before pregnancy and in early pregnancy can significantly reduce the risk of birth defects, especially neural tube defects such as spina bifida, in infants. So, universally, it is recommended that all women of childbearing age who might become pregnant take 800 micrograms of folic acid, or a prenatal vitamin containing folic acid, on a daily basis. The Spina Bifida Association stresses that, "Research shows that if all women who could possibly become pregnant take a multivitamin with folic acid, the risk of neural tube defects like spina bifida could be reduced by up to 70 percent." It's also generally recommended that women who are pre-menopausal, that is, entering the change of life, take 800 IU of Vitamin D and at least 1,200 mg of calcium to help prevent bone loss and osteoporosis. When it comes to senior citizens, if they're generally healthy and eat a proper diet, they may not need vitamin supplements. But many older adults often suffer from poor nutrition and little sun exposure. Many could probably benefit from taking a daily multivitamin that will give them additional Vitamins D and B. Also, it's not a bad idea for vegetarians, especially vegans, to take a daily multivitamin, since they could be deficient in certain vitamins, such as B-12, found primarily in meats. And alcoholics are often deficient in Vitamins like A, B, C and folic acid, so they may benefit from a multivitamin, as well.